In 1978 Alain and Claude-Michel started working on a musical adaptation of Les Misérables in French. This show was inspired by Alain’s visit to Cameron Mackintosh’s production of Oliver! in London. When Alain saw the Artful Dodger he immediately thought of Gavroche and the idea of Les Misérables as a stage musical was born. The concept album was released in 1980 and the white front cover showed the full Emile Bayard lithograph of the little waif Cosette with her broom; the album sold 260,000 copies. In September of that year the great French director Robert Hossein staged their work as a show, which was a mix of musical theatre and dramatic musical tableaux. It was staged during a three month slot at the 4,500 seater Palais des Sports in Paris and was seen by half a million people – a triumphant success for such a new genre in France. It was some two years later that a young Hungarian director, Peter Farago, took a recording of the show to Cameron Mackintosh, who, without understanding the lyrics, recognized that it was something very special. Cameron very quickly decided he wanted to produce the show and he put together a brilliant creative team with Trevor Nunn and John Caird as directors and James Fenton as lyricist. There was a huge amount of reworking to be done to make the show what it is today and a much fuller story than the original French version, which began at the factory gates and ended on the barricade. James Fenton was considered a brilliant poet but he worked slowly and it was found that his lyrics were more like poems and just would not sing well. After 18 months he was replaced by Herbert Kretzmer who had to work at breakneck speed in order to complete the lyrics with only five months to go before the show opened. The first night at London’s Barbican Theatre on 8 October 1985 was greeted by an enthusiastic response from the audience and a long, emotional standing ovation. So it came as something as a shock to find that the reviews were almost all appalling. The late Jack Tinker, of London’s Daily Mail, christened the show “The Glums” and it was variously described as: ‘”a load of sentimental old tosh”, “a witless and synthetic entertainment”, “a turgid panorama” and “a crude cops and robbers epic”. The public, however, made up their own minds and within 3 days every performance of the 2 month run at the Barbican was sold out. It looks like critics are not infallible! The show transferred to the beautiful Palace Theatre, where it continued running, until it transferred to the Queens Theatre in April 2004. On 8 October 2006 Les Misérables celebrated its 21st Anniversary and became the longest running musical in the world. Les Misérables first opened in America at the Kennedy Opera House in Washington, D.C. before transferring to the Broadway Theatre, New York on 12 March 1987. The critical response here was very different and the show received rave reviews, even impressing Frank Rich, the much-feared drama critic of the all-powerful New York Times. The production quickly recouped its investment and ran for 16 years until May 2003. 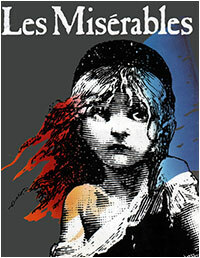 But as part of the Les Misérables “Coming of Age” celebrations it re-opened at the Broadhurst Theatre in October 2006. Les Misérables has been opened by 64 professional companies worldwide. It has been translated into 21 different languages with productions in 38 countries as different as Japan to Iceland or Norway to Mexico. It has received countless awards including 8 Tonys and there is a multitude of different cast recordings in many languages. The show has a uniquely universal appeal and audiences respond in the same way at the same moment to the same part of the show wherever they are in the world. Hugo himself said of his novel: “I do not know whether it will be read by everyone, but it is meant for everyone.” He certainly achieved the universal audience he hoped for with his novel, and the musical on which it is based has achieved exactly the same kind of universal acclaim and popularity. Javert releases Jean Valjean from prison after 19 years. However, he is on parole with a yellow ticket of leave, which he always has to show and which makes him an outcast. Only the Bishop of Digne treats him kindly, but Valjean, embittered by years of hardship, betrays his trust and steals his silver. When the police catch Valjean and bring him back, the Bishop lies to save him but makes him promise to become an honest man. Valjean has broken his parole and now, eight years later, he has become the mayor and a factory owner. Fantine, who works at his factory, has an illegitimate child, Cosette, and when this is discovered she is dismissed. She believes that her daughter, who is lodged with the Thénardiers, is dying and she is desperate to get money for her medicines. She first sells her locket, then her hair and finally joins the whores in selling herself. Fantine, who is sick herself and utterly degraded, fights with an unpleasant prospective customer. She is arrested by Javert but Valjean intervenes and demands that she be taken to the hospital instead. When Valjean rescues a man pinned under a runaway cart, Javert is reminded of the strength of convict 24601, who broke his parole and for whom he has been searching for years. But he claims that this man has just been recaptured. Valjean faces a moral dilemma, realising that this would finally set him free from the repercussions of his broken parole, but he cannot bear to see an innocent man go to prison in his place and confesses that he is prisoner 24601. Valjean flees to the hospital and promises the dying Fantine to find and care for her daughter Cosette. Javert arrives to arrest him, but Valjean’s superior strength ensures his escape. Valjean finds Cosette at the Thénardiers, who have treated her cruelly, while spoiling their own daughter, Eponine. They drive a hard bargain with Valjean, who pays them substantially so he can take her away. Nine years later, Valjean and the grown up Cosette are helping the poor when they are set upon by Thénardier and his gang. The attack is interrupted by Javert who does not recognise Valjean until Thénardier enlightens him, by which time Valjean has escaped. During the scuffle of the attack, the student Marius and Cosette have literally bumped into each other and fallen in love at first sight. There is much unrest in the city and the politically minded students of the ABC café plan an insurrection. After the death of General Lamarque, the only man left in the Government who shows any feeling for the poor, the students see this as a sign to raise support for an uprising. Thénardier’s daughter Eponine proves how much she loves Marius by unselfishly helping him to find Cosette. Marius and Cosette declare their love, and Eponine, waiting outside the gate, prevents an attempt by her father’s gang to rob Valjean’s house. Valjean, convinced that it was Javert spying outside his house decides they must leave the country. The students prepare to build a barricade, and Marius asks Eponine to take a letter to Cosette. This is intercepted by Valjean, who learns of his daughter’s true feelings. The barricade is built, and the students defy an army warning to give up or die. 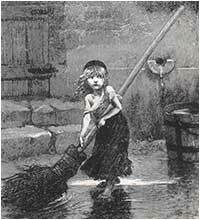 The little street urchin Gavroche sees through Javert’s disguise and exposes him as a spy. Eponine returns to the barricade to be with Marius, but is shot and dies in his arms. Valjean joins the students at the barricade in order to find Marius and although he has the opportunity to kill Javert he lets him go. The students rest and Valjean prays that Marius will be saved. Gavroche is shot while trying to gather ammunition behind the barricade, and then everyone else except Valjean and Marius are killed in the fighting. Valjean escapes into the sewers with the unconscious Marius, avoiding Javert who is still in pursuit. Thénardier is robbing corpses in the sewer, including Marius, who he thinks is dead. As Valjean and Marius emerge from the sewer, Javert is waiting for them. But after Valjean pleads for time to take Marius to the hospital, Javert lets him go. Shattered by the overturning of his black and white beliefs, Javert takes his own life. Marius finds it hard to accept that he is still alive when all his friends have died. Unaware of the identity of his rescuer, he recovers in Cosette’s care. Valjean confesses the truth of his past to Marius and insists that he must go away, believing that his past might threaten Cosette’s security. At Marius and Cosette’s wedding, the Thénardiers try to blackmail Marius. Thénardier claims that Cosette’s father is a murderer and as proof he produces the ring which he stole from the “corpse” on the night the barricade fell. Marius recognises the ring as his own and suddenly realises that it was Valjean who rescued him from the barricade that night. Valjean, sadly alone and dying, is joyfully reunited with Cosette before he dies. Cosette then reads the letter he has given her and learns the truth about her past as the spirit of Valjean joins the spirits of Fantine, Eponine and all the students who have died. The original concept album of Les Misérables in French is available from First Night Records. There are many other recordings including The Original London Cast, The Original Broadway Cast, The Complete Symphonic International Cast, as well as many cast recordings in other languages such as Japanese, Czech, Danish, German, Hungarian and Spanish. The 10th Anniversary Dream Cast Concert recording is available on both CD and DVD. The DVD includes Stage by Stage: The Making of Les Misérables.